The other day, I walked to a Bank in Haiti to open a Bank account and the customer service representative told me that I need to have an electric bill in my name as proof of address before I could open that bank account. "Do you guys have the same last name?" the rep asks me. "In that case, Mr. Saint Preux, you need to go home and come back with a notarized document from your cousin attesting that you actually live in this address before you can open the bank account," she replied. This is not just the rule for a specific bank, this is for ALL banks operating in Haiti... This is an order from Haiti's Central Bank... NO Proof of address... NO Bank Account. She replied: "fok yon juje de paix oswa yon notaire bay yon atestation ke yo viv la"
That's called shooting yourself in the foot. Clearly there is a disconnect between the basic understanding of economics by the central bank of Haiti and the economics of capital flow into the country. I'm sure that part of this measure has to do with capital flow out of other countries into haiti. Someone is concern that too much capital will drive inflation. 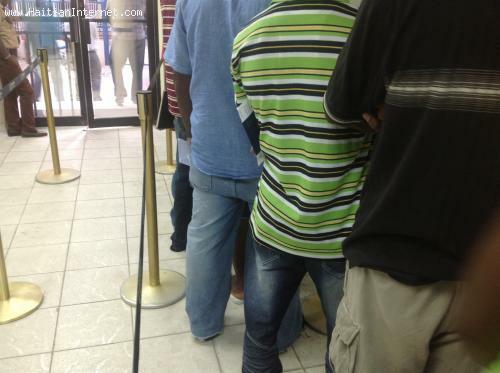 when you want to open a bank account in the USA they ask for proof of address and you comply but when they try to do it the right way in Haiti you complain. what a country!!! anything that has to do with order and discipline is repulsive to Haitians. I am concerned about Haiti with everything that is going on right now. I have a feeling that Martelly is giving away the country to those Bourjois RESTAVEK who have not done anything to uplift our citizen from poverty. These group of people were already responsible for 54% of the country's wealth, now is shooting right around 63%. You are stupid liar and retarded.